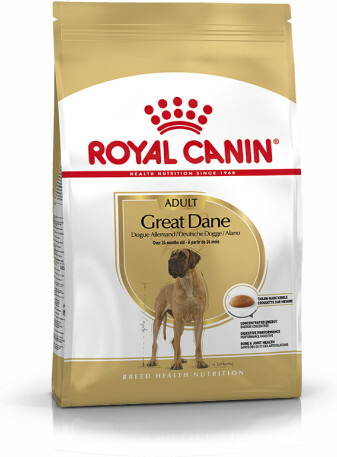 Great Dane Adult Royal Canin Great Dane Adult dry dog food, from 2 years old. Bone & joint health This specific formula helps support healthy bones and joints and maintain ideal weight. Enriched with EPA & DHA. Concentrated energy Adequate energy level to meet the hight energy needs of the Great Dane without overloading the stomach. It is important to divide the daily ration into at least 2 meals in order to limit the risk of gastric dilatation-volvulus. Digestive performance Contributes to supporting digestive health while taking into account the Great Dane's digestive sensitivity, thanks to highly digestible L.I.P. * proteins and a selection of specific fibres to limit intestinal fermentation while supporting a balance in the intestinal flora. *Protein selected for its very high digestibility. Animal fats, tapioca, dehydrated poultry protein, vegetable protein isolate*, maize flour, rice, hydrolysed animal proteins, vegetable fibres, minerals, fish oil, beet pulp, soya oil, yeasts and parts thereof, hydrolysed yeast (source of manno-oligo-saccharides), hydrolysed crustaceans (source of glucosamine), marigold extract (source of lutein), hydrolysed cartilage (source of chondroitin). Crude ash: 6.6%. Crude fibre: 2.4%. Crude oil fats: 25%. Moisture: 0%. Protein: 23%. Vitamin A: 31000 IU, Vitamin D3: 800 IU, E1 (Iron): 59 mg, E2 (Iodine): 5.2 mg, E4 (Copper): 14 mg, E5 (Manganese): 66 mg, E6 (Zinc): 144 mg, E8 (Selenium): 0.16 mg - Technological additives: Clinoptilolite of sedimentary origin: 10 g - Sensory additives: tea extract (source of polyphenols): 150 mg - Preservatives - Antioxidants. * L.I.P. : protein selected for its very high digestibility.